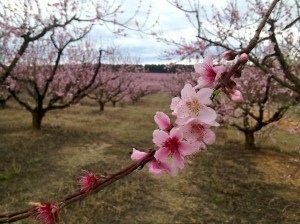 Johnston Peach Blossom Festival On Tap for May 4-5. This weekend, the Johnston, SC, Peach Blossom Festival will showcase great entertainment, arts and crafts, food concessions, a parade, rides for children, and a family-oriented street dance. This year’s Johnston Peach Blossom Festival Corporate Sponsors are Edgefield County Hospital, First Citizens Bank, IGA, SCE&G, Edgefield Fuel and Convenience, J.W. Yonce and Sons, Northland Cable and SRP Federal Credit Union. The Festival kicks off on Friday night, May 4, with a street dance in the municipal parking lot in downtown Johnston, designed especially for families, is free and will be held from 8-11 p.m. Music for this dance will be provided by Steele Justice, a popular local band. The Festival continues at 9 a.m. Saturday, and the free entertainment begins at 10 a.m. and continues until 4 p.m. The parade is held at 10:30 a.m. All events are held in downtown Johnston on Calhoun Street. The parade Grand Marshal this year is Mr. Frank Burt, 94. Mr. Burt, a veteran of World War II, has been a builder in Johnston most of his life. He helped build numerous houses on Lakeview Drive, among many other places, and built his own house on Hillside Drive in Johnston 32 years ago. When he as in his forties, he started his own company, Burt Builders. A member of Mine Creek Baptist Church, Mr. Burt has been a Deacon for over 45 years, and he constructed the Church building. The popular Festival is now in its 29th year. A new addition to the Festival is that WJBF-TV brought its Hometown Tour to Johnston on Friday, April 27, one week before the Festival, to highlight the traditional Festival and Town of Johnston. The live broadcast was held 5-7 p.m. that night from the Municipal Parking Lot next to the mural.